Husk corn and remove silk. Brush corn and onions with oil. Cover and grill corn and onions 4 to 6 inches from medium-hot heat 5 minutes. Remove onions from grill; set aside. Turn corn. Cover and grill about 15 minutes longer, turning twice, until tender. Remove corn from grill; cool 20 minutes. Cut corn from ears. Cut onions into slices. 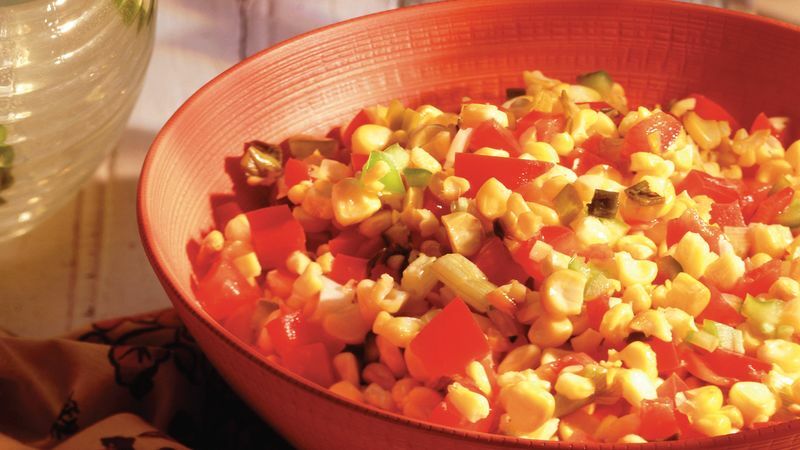 Mix corn, onions and remaining ingredients. Serrano chilies make good--but hotter--stand-ins for Anaheim chilies. A jar of Roasted-Corn Salsa and a bag of gourmet chips make a welcome hostess gift.